It’s been over a week since we returned from vacation, but I’m still not really ready to be back to our usual schedule. It is still summer after all. We escaped the Austin heat and spent a week in the mountains in Colorado where we hiked on trails under bright, sunny skies in Beaver Creek, Vail, and Breckenridge. This wasn’t really a food-focused trip, but a few meals were definitely memorable. The homemade donuts at Northside Kitchen were nearly habit-forming, and we had to stop in for one last fix on our way to the airport. Another gem was found in Aspen. I highly recommend a visit to Meat and Cheese which is a gourmet shop and restaurant with very well-sourced items both to purchase and on the menu. Another meal that I keep thinking about involved a simple salad with watermelon, grilled chicken, and arugula at a spot in Avon. 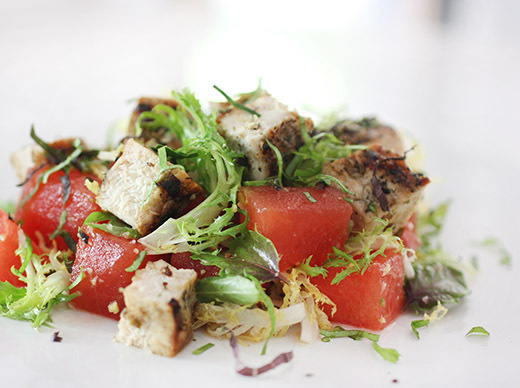 I love using watermelon in savory dishes, and the light, crisp, sweet chunks are perfectly refreshing summer food. Watermelon with seared haloumi, basil, and olive oil is one of my favorite salads, and watermelon with feta and olives is another. But, that salad with grilled chicken got me thinking about this recipe I knew was stored away in my files from a few years ago. In the September 2011 issue of Food and Wine, those ingredients were given a Thai spin. As soon as we got back home, I found the recipe and fired up the grill. First, the chicken needs to be marinated while the grill is being prepped. Lemongrass is needed, and I was thrilled to have some growing again that I could use here. It was minced and mixed with canola oil, and I added some minced serrano chiles as well. The chicken was added to the oil and left to marinate for 30 to 60 minutes. After being grilled, the chicken was allowed to cool before being chopped into cubes. The watermelon was seeded and cut into cubes as well. The dressing was a simple mix of Thai chiles, lime juice, fish sauce, water, and more canola oil that was mixed and pureed in a food processor. The original recipe suggests mint and cilantro, and they would be great but I used Thai basil, purple basil, and Genovese basil instead since that's what's growing in my herb garden. I also added some frisee leaves. 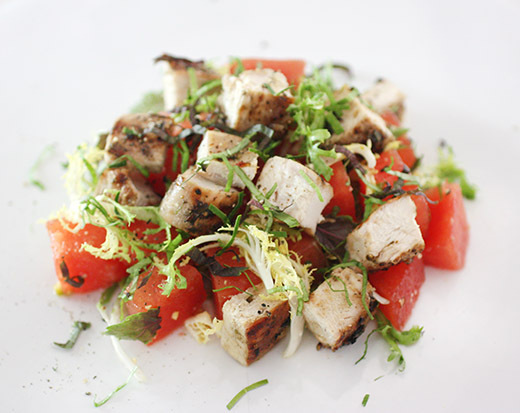 The herbs, frisee, and watermelon chunks were tossed with the dressing. That mixture was plated and topped with the cubed chicken. I garnished with more herbs and a chiffonade of lime leaves from my tree. This salad is everything I want in a summer meal. It’s light but still satisfying and full of bright flavors. 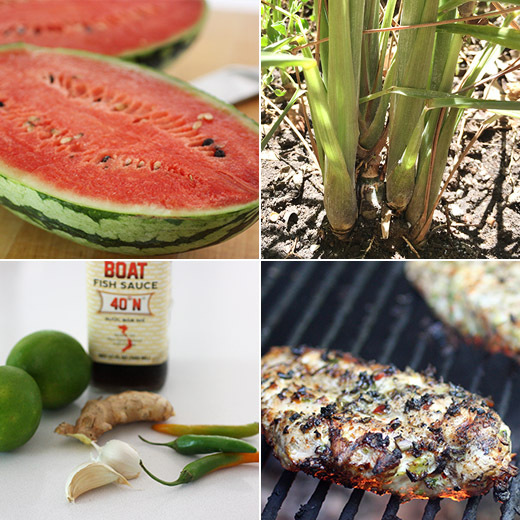 Lime juice and chiles are meant to be with juicy watermelon, and the flavors of the chicken and herbs pair well with it too. If vacation has to be over, at least I can still eat like it isn’t. I’m not the only one who’s excited about okra season, am I? It’s such a mild-tasting, abundant summer vegetable, I think more people should love it. And, it’s versatile. Grilling, pickling, stewing, roasting, and frying are all delicious options. It pairs perfectly with tomatoes, and I’ve enjoyed that combination many times. However when I saw this Basque take on that theme, I had to try it. This dish is found in The Basque Book: A Love Letter in Recipes from the Kitchen of Txikito , and I received a review copy. I quickly fell for this book because it brought back memories of our trip to Spain a few years ago. The photos of the market in Ordizia, of those lovely guidilla chiles, and of the garden plots reminded me of all the wonderful things about Basque cooking and the quality of ingredients. The book introduces the basic ideas of Basque cuisine while explaining how some dishes have been interpreted in new ways for serving at the restaurant Txikito in New York. There are pintxos, vegetable dishes, egg dishes, seafood, soups, recipes for gatherings, sweets, and drinks. There are also some suggestions for building menus from the recipes. Some of the loveliest recipes are the simplest like the Gilda which is one of my favorite pintxos. It’s a skewered stack of olives wrapped with an anchovy fillet with a guindilla chile near the top. Also, the Avocado Salad is simply half an avocado with Txakoli wine vinegar, Spanish paprika, sea salt, and olive oil. There are several delicious mixtures to serve on slices of baguette like the Gratin of Deviled Crab and the Gratin of Artichoke Hearts, Roncal, and Jamon Serrano. Another dish I want to try is called “Messy Eggs” with Rough-Cut Potatoes in which potatoes are par-boiled and then fried and topped with fried eggs with frilly edges. And, I’ve wanted to try making Basque-style Yeast Buns for years. Here, they’re filled with a sweetened whipped butter and creme fraiche mixture. Every recipe comes with an explanation of the ingredients or cooking techniques that make it special. For this okra dish, the tomato sauce is the secret weapon so to speak. And, if I can’t talk you into enjoying okra, the sauce would be great on other summer vegetables too. 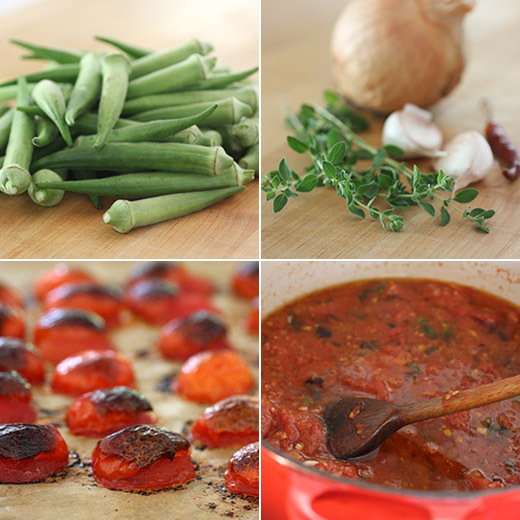 To make the tomato sauce, fresh tomatoes were roasted in a 500 degree F oven. I used juliets from Boggy Creek Farm. The tomatoes were cut in half, tossed with olive oil and salt, placed cut side down on a parchment-lined baking sheet, and roasted for about 15 minutes until charred. Meanwhile, finely diced onion, minced garlic, marjoram leaves, and a dried chile de arbol were combined with a generous amount of olive oil in a large saucepan and cooked over low heat. In my case, I used oregano rather than marjoram because it grows amazingly well in my backyard. The mixture should cook slowly until softened and sweet without browning. Canned tomatoes were crushed by hand and then added to the onion mixture. The roasted tomatoes were pulsed in a food processor until chunky and then added to the saucepan as well. Salt was added, and the sauce was left to simmer and thicken for about an hour. After removing the sauce from the heat, chopped parsley was added. The okra, incredibly fresh and also from Boggy Creek Farm, was roasted and charred. It was first cut into thick rounds, tossed with olive oil and salt, spread on a baking sheet, and then baked at 425 degrees F for about 15 minutes. The yogurt sauce was made with a small bit of minced garlic, chopped mint, marjoram—or oregano, and salt. 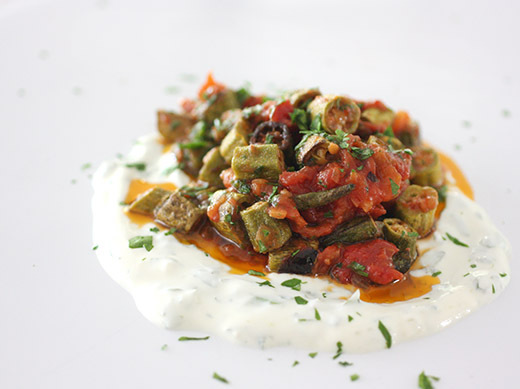 The roasted okra was tossed with the tomato sauce and served with the yogurt sauce. After a nice, long simmer, the tomato sauce developed amazing flavor. I wanted to sit down and dip chunks of bread into the saucepan until it was empty. Instead, it was an excellent partner for the roasted okra. 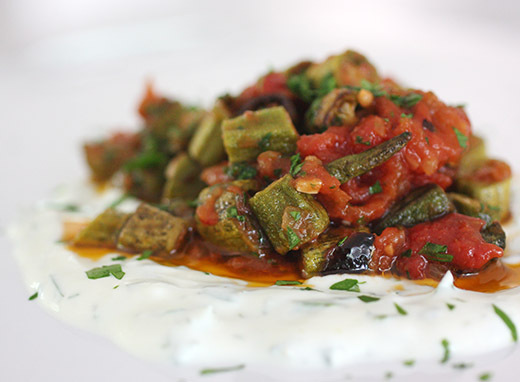 The tangy, minted yogurt nicely countered the stewed and roasted flavors of the okra and sauce. Now, I wish I could walk outside and wander into bar after bar to sample pintxos just as we did in Bilbao and San Sebastian. But, at least I can now create more Basque dishes in my own kitchen.